Local children line up in wait for their turn to seek Easter Eggs at Valhalla Park in Holt. The Holt Easter Egg Hunt draws hundreds of children to the town every year. Easter Sunday is always a busy day for the Easter Bunny. But for the past 50 years, he’s made an appearance in Holt every Saturday before his biggest day of the year. Local children line up in wait for their turn to seek Easter Eggs at Valhalla Park in Holt. The Holt Easter Egg Hunt draws hundreds of children to the town every year just before Easter Sunday. The special occasion? The annual Holt Easter Egg Hunt, held at Valhalla Park. Attracting hundreds of kids up to 10 years old from the Lansing area, the hunt is a happy chaos of children celebrating one of America’s most beloved holidays. Local residents like Barb Bellows has been coming out to the Holt East Egg Hunt for three years. She loves the community of the event. 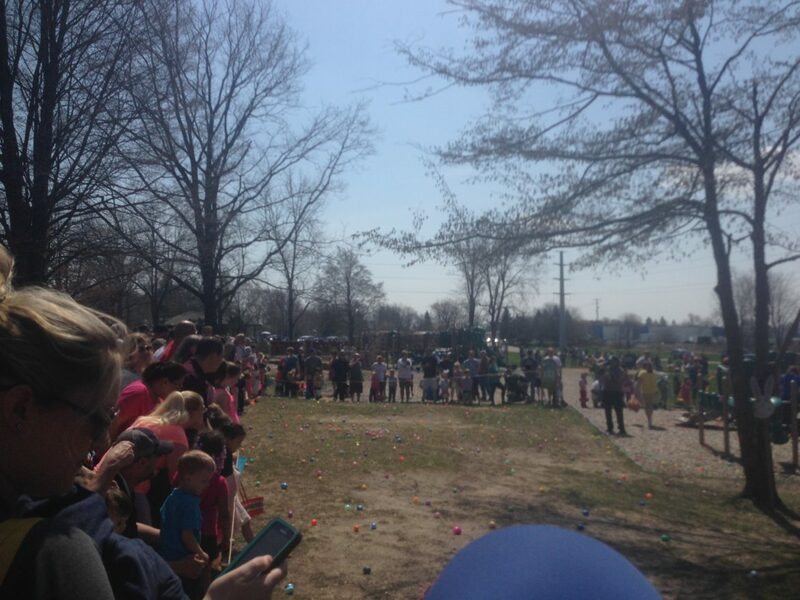 “The mad dash of the kids to get the eggs just cracks you right up,” Marciniak-Bellows said. 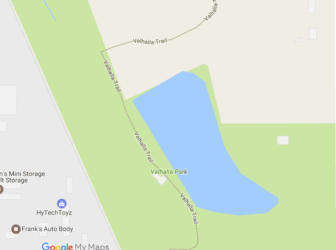 The Holt Easter Egg Hunt happens every year ay Valhalla Park, located on the corner of Keller and Pine Tree roads. It is Holt’s largest and most developed park, at 45 acres. Sponsored by the Holt Kiwanis Club, and sticking around for “some 50 years” according to township officials, the hunt has a bit of a history. In the 60’s, when it began, township officials hid classic hard-boiled and hand-dyed eggs for children to find. But one spring, not long after the hunt began, temperatures rose to the mid-80’s, and fears of salmonella poisoning brought today’s plastic eggs filled with candy into the picture. The hunt has grown into a community affair. The event is also “green”—parks and recreation employees and township officials collect the used and discarded eggshells from families as the event closes, most of them with the hopes to be recycled for next year’s event. About 600 children and their families showed up for this year’s hunt, which took place on a beautiful, 75-degree afternoon. That’s about average for this event. A petting zoo featuring a few rabbits and baby chicks was available—a new addition. Children lined the edges of the playground and were separated by age group so that toddlers and older kids weren’t mixed up in the crazy fray to find the eggs. In the end, every child walks away with something. The best part? The event is completely free. Free admission, free photos with the Easter Bunny, and free candy to take home. The township has partnered with local food stores like 7-11 and McDonalds to give away free coupons to families as well. The event, Hayhoe said, comes to about $350 every year, but the Kiwanis Club covers the costs. The township, he said, doesn’t make a single cent off it. At the heart of it all? “The kids, they love it.” Hayhoe said.